From within the League+ Dashboard, click the name of the League you wish to create a Season for. Choose the blue Create a Season link. Enter the name of the Season you wish to create. I.E. 2018 Fall Season. Enter the Start and End Date for your Season. 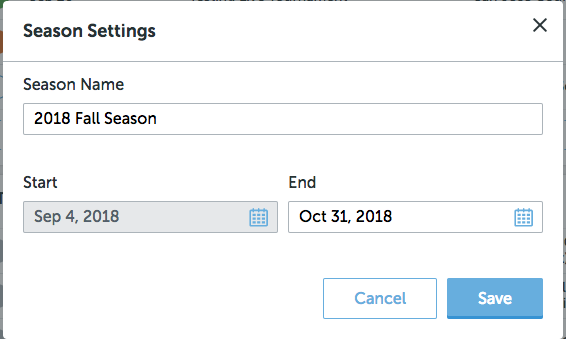 Note - After you save the Start & End Date of your Season, you cannot go back and condense the season dates, but you can expand them. For example, if my season ran from Sep 10th to 15th, I cannot change it from the 11th to 14th, but I could change it from the 5th to the 30th. To add a Tournament to your Season, click the "+ Add a Tournament" link. Your Tournament will default to the "Scheduled" mode, where you can add the Date, Tournament Name, and Course Name to just get organized for your Season, or choose the Set-Up link to complete the Setup of the Tournament. Scheduled: A Scheduled Tournament in your Season is simply a placeholder for a Tournament. This indicates that you have yet to complete the full Setup process for this Tournament. If you wish, using the trash can icon on the right side of the screen you can delete a Scheduled tournament. Upcoming: Tournaments in the Upcoming status are scheduled tournaments that have had the Setup of the tournament completed. Choose the pencil icon next to this Tournament in order to manage it. Live: When you see the Green LIVE in the Status column, you know that a League Season Tournament is being played today. For a Tournament in the Live status, you can choose the pencil icon to manage the Tournament, or quickly jump to the Leaderboard tab. *For more information on managing a Tournament, navigate to the Tournament+ articles. CLICK HERE! As soon as your current Season has begun, you can click the Plan for Next Season link to set up your next upcoming Season. - The earliest possible start date for this Season is 1 day after the conclusion of your current Season. - You can only create one future Season at a time.